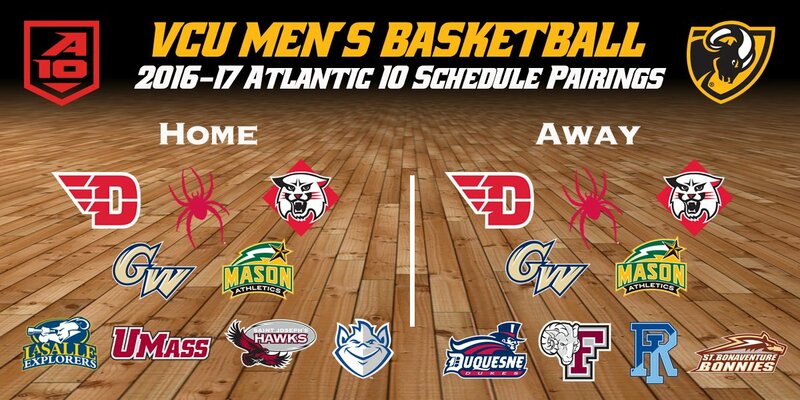 The Atlantic 10 released the 2016-17 conference schedule pairings yesterday with a surprise home-and-home matchup between two of the conferences top teams: VCU and Dayton. The Rams maintained home-and-home matchups with previous “A-10 South” foes Richmond, Davidson, George Mason and George Washington but got a schedule upgrade with the swap of Saint Louis twice a year (who has finished within the bottom-two of the conference the past two seasons) for the Flyers of the University of Dayton, one of the Atlantic 10’s most consistently good programs outside of VCU. The Rams will now host Saint Louis in their only game with the Billikens this season and get La Salle, UMass and Saint Joseph’s as well. VCU’s A-10 road schedule will be a challenging one, heading to Kingston, RI for their only matchup with Rhode Island next season. The Rhody Rams have gotten several preseason top-25 mentions thanks to a talented returning roster that should include star guard E.C. Matthews, who missed this past season after suffering a season-ending injury 10 minutes into his season. VCU will also face a tough St. Bonaventure crowd in their only game against the Bonnies, head to an improving Fordham team and take on a Duquesne team on the road who will lose the majority of their key players from last year’s team.